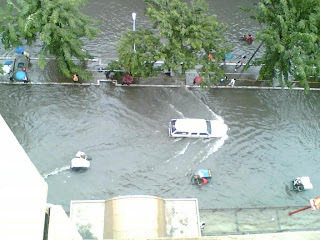 The best yung baha along Buendia-Mayapis area this morning - the worst ever. The road wasn't passable by vehicles until after lunch. It's because of the sudden heavy shower brought by typhoon Egay. And according to our guard, it's also because the Manila bay was already umaapaw due high tide so the flood had nowhere else to go. Rose, Steng and I had to hire a tricycle. But since the seat wasn't high enough and di ko carry na mag sit on-the-air while nakaangat yung paa, nabasa ang pwet ko! Ewww talaga... baka magkaroon ako ng an-an, buni or alipunga sa lovely buns ko huhuhuhu :( I have to treat my buns to some extra TLC this evening - scrub it and lavish it with alcohol para ma-disinfect. At least on the bright side, the drought is over. 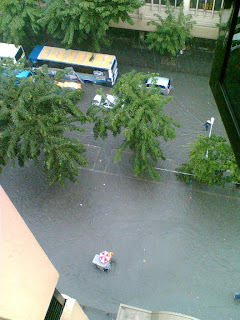 A view of the flood as seen from Rose and Steng's unit.